Embrace a Child a Big Success! This year, 28 Hartshorn teachers collaborated to donate to three children through Embrace a Child. 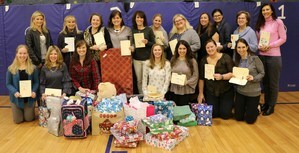 Pictured are the gifts the teachers bought for these three young children, along with 18 of the teachers who contributed them. Due to the teacher’s efforts, three children will have a much brighter holiday season! Pictured: 1st Row (Left to Right) - Ms. Cisko, Mrs. Hume, Mrs. Small, Ms. Renehan, Ms. Jacobs, Mrs. McGowan, Mrs. Barnhard.